TSC Talks; Episode 30, Riding the Waves of TSC & TAND, an Update with Marlo, TSC Mom & Past Chair of the TS Alliance of New England | TSC Talks! 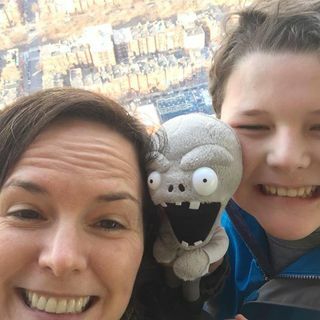 Marlo Grolnic, TSC Mom, past chair of the Tuberous Sclerosis Alliance of New England and previous guest on TSC TALKS in September 2018, takes time out of her day to give us an update on how her son's adjusted to an out of district placement he had just started when we spoke in the fall. She elaborates on how this adjustment has been for the family, as well as describing improvements in TAND related behavior since we last spoke. TAND (tuberous sclerosis associated neuropsychiatric ... Más informaciones disorders), affects 90% of those with a diagnosis of TSC. She also answers some questions that have come up in Facebook groups related to TAND and gives a perspective of what has worked for their family, how it has worked, as well as what has not worked, Behaviors related to TSC are a double whammy on top of the medical aspects of TSC care and management. Marlo, a bit of a veteran of the TSC/TAND lived experience, acknowledges the ongoing uncertainty and challenges TSC/TAND has presented, yet also provides insight and information, and once again, hope that quality of life is possible.